Working out at gyms and keeping the body fit is a healthy habit. I personally appreciate those who wake up early in the morning, clean up and do some workouts. Health is wealth and this must always be our first priority. Using gym equipment that are already laden in sweat. Generally, people sweat vigorously in the gym at the time of exercise. The gym’s atmosphere is often hot and moist. Therefore, in most of the times, the clothes, shoes, towels and other gym gears are covered with sweat. This is an ideal situation for the germs and bacterias to survive. Plastic bottles are not healthy for gym atmosphere. Plastics generally hold a lot of bacteria. Metal bottles are always preferred over the plastic bottles because they are safe and do not attract much bacterias. Wash the bottles at least once a week with lukewarm water and soap. Most importantly, always be careful that no one else sips into your bottle while you are not around. It helps the germs to get transferred into your body and you unknowingly fall sick. So, better buy a metal bottle and do not let anyone sip in your bottle. Cleaning down the gym equipment after every use is importantbecause a lot of sweat and dirt get accumulated in the gym equipment and they may result in spreading infections. So the best way to stay safe is to use gym wipes to clean the gym equipment before and after the workout session. Standard gym equipment wipes come with anti bacterial and disinfectant qualities. Wipe the gym equipment regularly with these wipes. While you take shower in a gym, you need to keep in mind that it is being used by other hundreds. So while you are taking shower in a common bathroom, always wear your own slippers so that your feet do not touch the bathroom floor. A lot of germs and viruses can be accumulated in the bathroom floor. Never use common towels and soaps as they may spread infections. At least once a week, soak your slippers in bleach water. This will kill all the germs in the slippers. While you are sick with a common flu, cough and cold, do not go to gyms. This won’t harm you any way but will save others in the gym from catching the cold or getting infected with the same virus. It’s good to take a day off from the gym in such situations. Stay fit and help others to stay healthy. When you are infected with some kind of germs or diseases its better not to use the common tub or swimming. Do not let your infections spread. Rather cure yourself and then dive in the tub. People go to the gym to stay fit and strong. Do not ever make it an unhygienic place. Frequently use the gym wipes to clean up the gym equipment and maintain some basic hygiene as mentioned above. The motto is to stay strong not sick. Why is it Necessary to Clean the Gym Equipment After Every Use? Gyms are for those, who love to exercise and keep their body fit. Going to gym regularly gives your body an extra boost of energy that your body needs each day. While you workout in a gym, you sweat and this is very healthy. Why do most of the people go to gyms? Most of the time, it is to burn the extra calories that the body has gained. While you exercise, you burn calories and start to sweat. The more you workout the more vigorously you sweat. So the fact is “ If you want to stay fit you will have to exercise and sweat”. This is the positive side of sweat or perspiration. Now let’s see its negative side. Everyday in gyms more than 100 people go to workout. Everyone of them perspires vigorously. Different gym equipment, from machineries to mats, all are drenched in sweat. This is very unhealthy and unhygienic also. It is true that gyms clean their machines but not after every single use. Cleaning the gym equipment before and after a workout is must. Sweats can carry germs and one person’s sweats can spread germs through equipment used in gyms. These germs can spread infections as well. Warm and moist places are the breeding ground of germs and viruses. If you ask me, I don’t know a better warm and moist place than gym. So gym is the best place for viruses to grow and spread diseases. Maintaining a minimum hygiene level in the gyms is must. Make a solution of borax and lemon juice both distributed as two tablespoon and one quarter cup respectively. Keep this solution in a bottle and shake well before use. Keep this solution with each equipment and ask your customers to use it after usage. Every time they use a machine, they should clean it off with this solution. This process will keep the gym equipment clean and hygienic. You should use gym equipment wipes that have disinfectant and anti bacterial quality in it. If you do not want to use the spray bottles or solutions, then, it would be better to use these gym wipes. Since these wipes have anti bacterial capability, they can easily clean off all the germs and viruses on the machines. 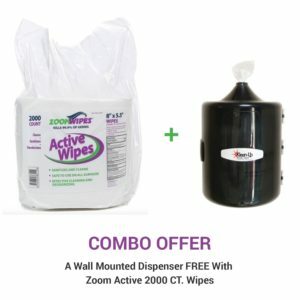 An exciting combo offer where you will be getting Wall Mounted Dispenser free w/ Zoom Active Gym wipes Only at $47.99 from Amazon Store. Many gyms have spray bottles that they offer to clean the gym equipment after every use. The spray bottles contain ammonia solution or a kind of cleaning agent in it. You do not need to be a skilled cleaner to use these bottles. Just spray them on the equipment and the work is done. It takes nothing to maintain hygiene but it takes a lot when you fall sick. So, better maintain hygiene in the gyms so that you do not fall sick. This is a good way to clean gym equipment and it doesn’t even harm your health anyway. Mix equal quantity of water and white vinegar into a spray bottle and keep it by the side of your equipment to make the users apply it after their usage. After every workout, the equipment should be cleaned by spraying the solution on the machines. But when you use vinegar solution, you must remember that it might produce corrosion. To prevent corrosion, always wipe the equipment well with wipes. Yes, towels do not kill the bacterias but they can wipe away the sweat well from the body. Now when you bring towel for your clients, also bring an extra towel to clean off the equipment after and before every use. This will help you to promote proper personal hygiene. After every single use of the gym equipment, you must always clean up the machines to keep the overall environment of you gym hygienic and healthy. Maintaining the hygiene in a gym is a necessity because you would never like deadly bacteria and viruses affecting the health of your clients and the reputation of your establishment.